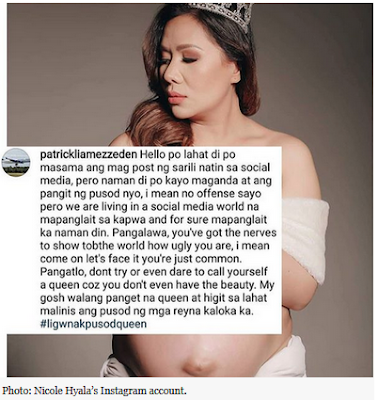 Emmylou Gaite-Tinana, better known as DJ Nicole recently slammed a netizen who critized her for posting baby bump in her Instagram account. In her lengthy post about Body and Face Shaming in her Instagram account, she told "that bullying was something that can only be done face-to-face". "However now, someone can be bullied online anonymously". "These online attacks sometimes lead to deep mental scars. I get these attacks. Everyday, Since I made necessary management decision in July." she wrote. "I know that there are many more who love me, compared to those who attack me. I am sure of that. Very sure. Face-shaming is horrible in itself, but I think body-shaming a pregnant woman is too much." "The nature of my job makes me an easy target for criticism. I understand that. But I do not deserve it. Especially not for the changes that occured as I grow a human being inside my body. Hamakin niyo na ako sa lahat ng aspeto. Wag lang sa pagiging nanay ko. Dahil sumusobra na kayo." "When my photographer asked if my belly button should be edited, or flattened out, I immediately answered with, "No." I embrace all my body changes including developing umbilical hernia from my 1st pregnancy. And if having more children will make my body go through more changes, then I will be more than willing to embrace them. Having a baby is a blessing, a miracle in itself." And to you Patrick (even if this is just a poser account), I hope that your mother will NEVER have to go through body-shaming. I pray that you will be careful with your words next time. Because words can kill or heal. Ending with this quote from Dr. Steve Maraboli - "When you judge a woman by her appearance, it doesn't define her. It defines you." WARNING : LENGTHY POST ON BODY AND FACE SHAMING Before social media, bullying was something that can only be done face-to-face. However now, someone can be bullied online anonymously. These online attacks sometimes lead to deep mental scars. I get these attacks. Everyday. Since I made necessary management decisions in July. I know that there are many more who love me, compared to those who attack me. I am sure of that. Very sure. Face-shaming is horrible in itself, but I think body-shaming a pregnant woman is too much. The nature of my job makes me an easy target for criticism. I understand that. But I do not deserve it. Especially not for the changes that occured as I grow a human being inside my body. Hamakin niyo na ako sa lahat ng aspeto. Wag lang sa pagiging nanay ko. Dahil sumusobra na kayo. When my photographer asked if my belly button should be edited, or flattened out, I immediately answered with, "No." I embrace all my body changes including developing umbilical hernia from my 1st pregnancy. And if having more children will make my body go through more changes, then I will be more than willing to embrace them. Having a baby is a blessing, a miracle in itself. And to you Patrick (even if this is just a poser account), I hope that your mother will NEVER have to go through body-shaming. I pray that you will be careful with your words next time. Because words can kill or heal. Ending with this quote from Dr. Steve Maraboli - "When you judge a woman by her appearance, it doesn't define her. It defines you."